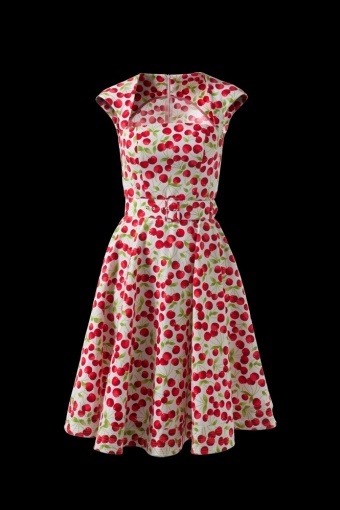 TopVintage exclusive collection, this is our last shipment of a fantastic 1950s style Cherry White swing dress by Swedish designer Emmy. This fantastic swing dress accentuates collarbones and bust without being too revealing. This hig queality dress has pefect fitting! A sewn-on piece with contrast stitching gives the skirt stability and flare. Made in a high quality white cotton material lightly stretching with texture. Long concealed zipper in back. Covered belt included. 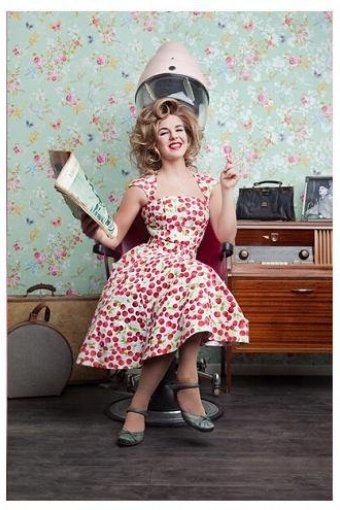 This 50s vintage style dress can also be worn with a petticoat underneath to add more volume. Whether your tastes run to traditional fifties florals or wild novelty prints, we've something to suit everyone and every occasion, from parties to summer picnics.